In the same vein as her other books about bringing extinct animals to inappropriate locations (Can I Bring Woolly to the Library, Ms. Reeder?, 2012), Grambling presents a tour of New York City with a saber-toothed tiger. 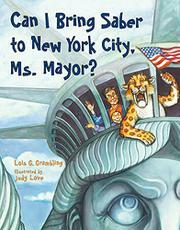 On the first page, a little boy implores the mayor of New York (shown here resembling nothing so much as a mildly depraved Janet Reno) to allow him and his pet saber-toothed tiger to visit her fair city. The boy elucidates the many places they could visit (all the usual NYC hotspots) while making it clear that Saber would be a real asset to Ms. Mayor in her day-to-day duties. After proposing a day of such imagined activities as scaling the Empire State Building from the outside, attending a Yankees game and holding a party in the Central Park Zoo, the boy comes to realize that perhaps the city would be too noisy for his little pet. Fortunately he has an equally kooky replacement in mind. Ice Age–loving kids would undoubtedly adore a Saber of their own, but that’s not enough to save this book. Grambling’s plot rambles, and Love’s exaggerated, sometimes-grotesque accompanying illustrations do not provide enough visual narrative to compensate.